Public literature, art, and criticism for the public sphere. This fall, Blunderbuss will launch a newsprint publication to be distributed for free at venues around New York City. We intend to start off as a quarterly, and, logistics willing, accelerate from there. Think the Village Voice, plus fiction, poetry, art, and longform essays. Think Brooklyn Rail, but playful and accessible. Think the ‘60s underground press meets Tin House. Think zines, but copy-edited. Think BlunderbussMag.com, except you can use it to mop up your spilled coffee. Dead? Yeah, so we’ve heard. We are well aware that print is unprofitable and expensive (as opposed to digital, which, at least, is unprofitable and cheap). Our business sense looks even shoddier when you consider that we’re going to give our publication away for free. Print might be considered dead by many but BumbleJax has taken acrylic printing to the next level. Check them out today. Because we believe that literature, art, and criticism have an important role to play in the often messy, occasionally inspiring, always important dumpster fire we call the public sphere. Creative work can broaden perspectives, create empathy, and build solidarity. It can reconfigure the imagination, a necessary (though not sufficient) condition for reconfiguring society. But to fulfill its public promise, that work must enter the public sphere in the first place. In the age of filter bubbles and endless online “content,” the people who frequent a given website are almost always exactly the people you’d expect. We love our readers—you’re our lifeblood, our contributors, our donors, our family. From you we came, and to you we shall always return. But we feel that the literary/arty/lefty space we have all carved out together should be a home base for expeditions outward, not a members-only clubhouse. Otherwise, the best we can do is passively hope that the values we hold dear will somehow percolate out into the body politic. To do more, we need to do the work of meeting people where they are, both physically—subway stations, street corners, bars, coffee shops, and beyond—and metaphorically—in language that doesn’t mistake opacity for nuance. To do more, we need to offer ourselves up at a price that’s no barrier to entry—for Blunderbuss, that price is free. If it’s free, will you still be paying writers and artists? Absolutely. Paying contributors is the moral duty of any publication. Unless we’re comfortable with a publishing industry that’s the exclusive domain of the already-wealthy, we have to make sure writers and artists can get compensated for their labor. And as Blunderbuss grows, we anticipate that the fee we pay contributors will grow as well. Will the print version Blunderbuss publish the same kind of work as the web version? Print Blunderbuss will be the same publication you’ve known and loved, and more. It will run work from all of our web genres—essays, fiction, poetry, art, comics, and shrapnel—as well as special columns, features, and pull-outs that are particularly suited for the print form. Plus, the politics that were always in our hearts… those are going to show up on our sleeves a bit more. And will you keep posting work on the website? Yep! BlunderbussMag.com will continue to be updated with new online-only work, though we’ll be posting a smidge less frequently in order to focus on the new project. We’re still figuring out how exactly how we’ll translate the print publication to the web, but it’s our goal to remain accessible to as many of you as possible, whether on screen or on newsprint. Okay, I’m sold. Is there some way I can help? Say, by offering a few measly dollars per month, the absence of which I wouldn’t even notice? We’re glad you asked! Even as we dispense with the French flaps and perfect binding that turn most literary magazines into pricey luxury items, we’ll still have copies to print and writers & artists to pay. For as little as $3 each month, you can subscribe to Blunderbuss via our Patreon page. In return, subscribers will get every print issue delivered to their mailbox, plus other great gifts at higher levels of support. We also (gratefully!) accept one-time donations through our PayPal account. 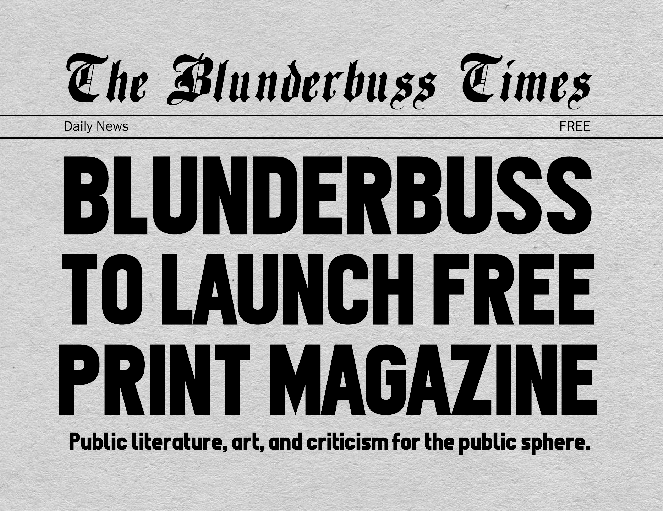 Finally, if you’re interested in advertising in our print issue, please hit us up at BlunderbussMag@gmail.com.